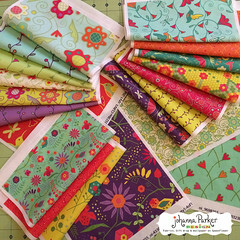 Pattern Pleasures with a Burst of Color! Thank you for your support & Happy Creating! * Then, it was time to slice 'em all up! 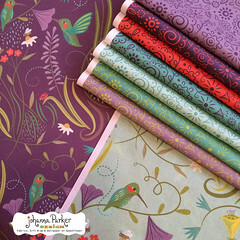 * Here's a quick and colorful glance at the swatches of my Garden Delights Collection! It's a wide palette of many colors, but they bridge across each other, offering coordinates for your crafting. 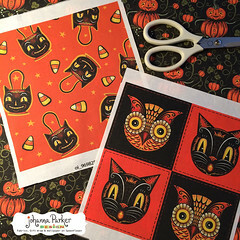 * I just added the two front designs to my Halloween grouping. 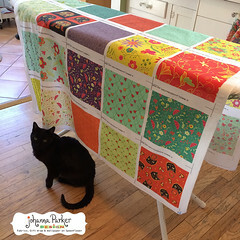 I designed the Halloween Cat & Owl Checkerboard design to fit just right on a standard 8" x 8" swatch! * "Nature's Frolic" ~ It's one of my favorite groups... 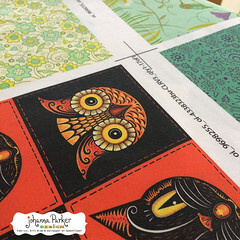 I used the same color palette throughout in order offer coordinates for your projects. Don't forget that these come in gift wrap & wallpaper too. 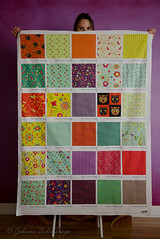 And, the Roostery has lots of pretties over there, just ready to be ordered and made to enjoy! I hope you enjoyed the peek! I need to take some crisper pics with a decent camera as most were captured with a cell. But, I was anxious to snap some photos! There will be more to come. I hope you enjoyed the peek. 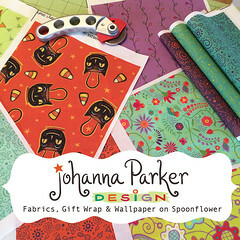 Please feel free to share your feedback, and I hope you'll think of my Spoonflower Shop when dreaming and designing your next projects. I can't wait to see, and I hope you'll share a photo or two.